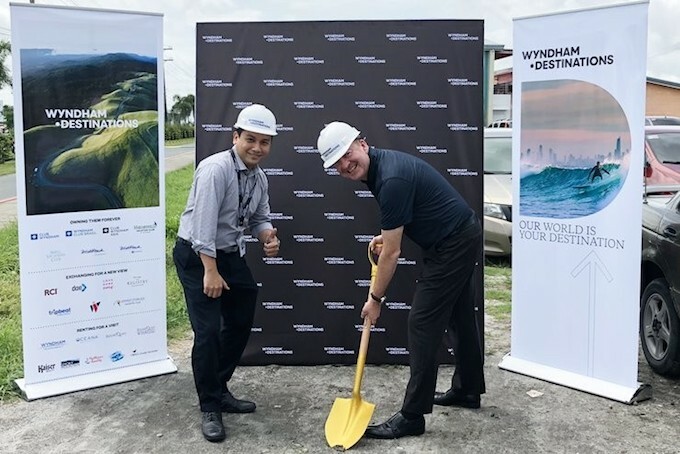 Wyndham Services Asia Pacific (Philippines) Inc., managed by Wyndham Destinations Asia Pacific, has broken ground and started the construction of its new office building at Philexcel Business Park in Clark, Philippines. Wyndham Destinations Asia Pacific is a division of Wyndham Destinations, the hospitality giant with a portfolio of more than 4,000 resorts in 100 countries and over 25,000 employees, who serve millions of families each year. Wyndham Destinations is made up of three lines of business: Wyndham Vacation Clubs, RCI Exchanges and Wyndham Vacation Rentals. The Asia Pacific teams form part of the Wyndham Vacation Clubs line of business. They manage, develop and market vacation ownership interests across two vacation clubs and a network of club resorts in the Asia Pacific region. The ground-breaking ceremony was attended by Liam Crawley, chief financial officer, Wyndham Vacation Clubs Asia Pacific and Jerry Estrada, director of Operations, Wyndham Philippines. The new building will include two levels of basement parking, spacious training areas, meeting rooms and a cafeteria. Once complete, the office will accommodate more than 600 employees. Construction is expected to be complete in early 2019. A team from Philexcel Business Park will help complete the construction of the establishment. “Clark is an ideal location to grow our offshore team thanks to its talent pool of skilled multilingual professionals, uncongested roads, well-connected offices to public transport terminals and a growing business landscape,” added Crawley. The Philippine entity was established in August 2017 and has provided offshore support to the company’s regional headquarters in Singapore, Shanghai and Gold Coast, Australia. In less than a year, the company has grown in Clark to more than 140 staff members employed across functions such as customer support, technical and IT support, communications and creative services, human resources, finance, customer experience, sales, revenue and marketing.